Yesterday I revisited one of my favourite places to see bluebells - Arlington bluebell wood in East Sussex - where I took this photo. As well as real English bluebells (rather than the more common Spanish bluebells) you can see white wood anemones and other wild flowers. There are also some blackthorns in blossom at the edge of the wood. 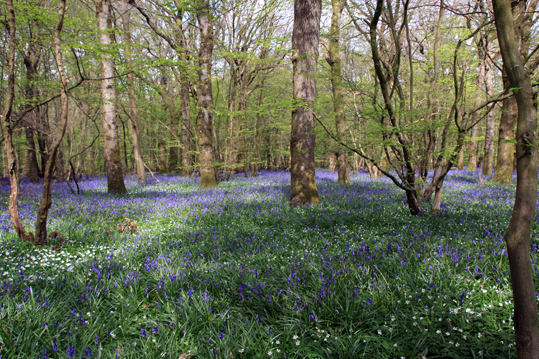 The woodland is managed by local charities and only open to the public for a few weeks of the year in April and May. You do have to pay to get in - £6 for adults this year - but the money goes to worthwhile causes. There are several walks you can do around the woods, over the Cuckmere river and across fields to surrounding farms. There is also a charity bookshop selling secondhand books, a chance to see farm animals and a tearoom. Every year the organisers run a photography competition with prizes for the best photos of flowers, landscapes and people.